Phone 09 890 4924 or email Research North to book. Research West, Waitākere Library - Second Tuesday of every month. The West Auckland Historical and Genealogy Society hold their branch meeting in this research centre on the same day 10am to 12noon, and everyone is welcome. 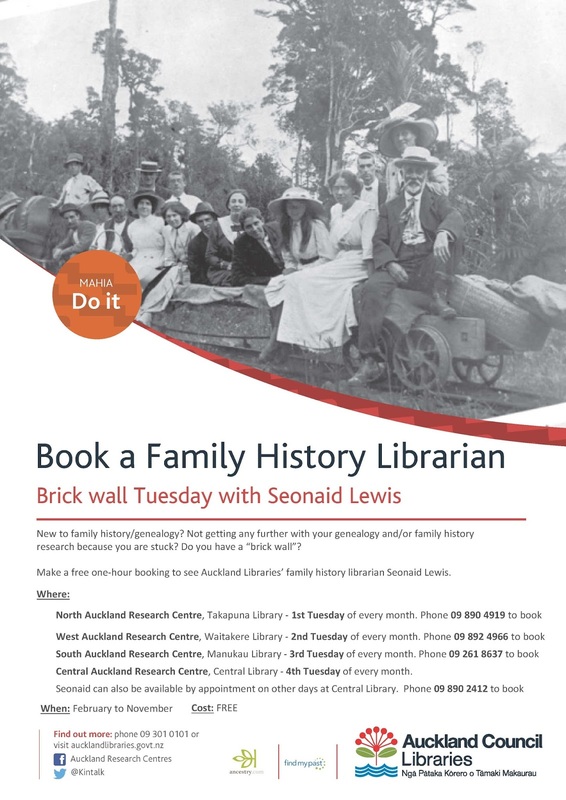 Research South, Manukau Library - Third Tuesday of every month. Phone 09 261 8637 or email Research South to book. Research Central, Central City Library - Fourth Tuesday of every month. The Auckland City branch of the New Zealand Society of Genealogists hold their branch meeting in this research centre on the same day, 10am to 12noon and everyone is welcome. Seonaid can also be available by appointment on other days at Central City Library. Phone 09 890 2412 or email Research Central to book. It is a "how to" training service to enable customers to be able to carry out their own research. It is not really a research service i.e.- we are not doing the research for the customer, although we may do so during the tutorial session. To get the best out of this session, we ask the customer to fill in a form telling us some brief background details and a pedigree chart of the branch of the family the query is about. Where have you looked already? What proof do you already have about that person (people)? Most importantly - have you already got hold of any birth, marriage or death certificates that may answer your question? Review them again with fresh eyes.